Traveling with your little ones can be a more pleasurable experience with the StarKids™ Snack & Play Travel Tray. Having three young children, I have tried numerous travel tray in the past and none have worked as well as this one by StarKids™. What makes the Snack & Play Travel Tray so unique is that it has a rim on all sides that actually keeps the toys, crayons etc. on it without falling off. This sturdy, firm surface is perfect for doodling, coloring, snack time and playing with favorite toys. There are two convenient mesh pockets on the side of the travel tray to hold a sippy cup, favorite toy, book etc. The fabric is well designed to withstand little hands and the tray sets up in seconds. I also like that it is easy to use and then store with a foam insert that collapses instantly and it also has an easy to attach (and release) buckle that keeps it in place. To be perfectly honest, my husband rolled his eyes when I told him that I had found a new travel tray for the kids because any of the ones that I have purchased in the past were a waste of money. Ultimately, we were both very pleased with the ease of use and functionality of the StarKids™ Snack & Play Travel Tray. 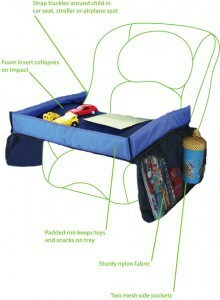 You can also use the StarKids™ Snack & Play Travel Tray with a stroller too or with an airline seat. This Snack & Play Travel Tray is the perfect travel accessory for parents with babies, toddlers or young children. You can purchase your own Snack & Play Travel Tray online or at retailers and it is attractively priced too. You are invited to visit the StarKids™ website to find a retail location or to learn more about this product and all the other products available at StarKids™. Connect with StarKids on Facebook and Twitter.